Discover the writings of Shalidor and benefit from his wisdom. Travel to the indicated location and retrieve Shalidor's Insights. Talk to Urag gro-Shub and ask him if there are any special books he's looking for. He will tell you that he's looking for a book Arch-Mage Shalidor wrote so he can translate his writings. The book can be located in the boss-level chest of any dungeon in the game including ones added in Dawnguard and Dragonborn, meaning that your destination is randomly selected from over 140 possible dungeons. For specific details about the target location, see its place page; details about any possible conflicts with other quests are also provided there. The book is in the dungeon's boss chest, normally located at the end of the dungeon. Return to Urag gro-Shub and return the book. He will say that it will take about a day to translate the writings. 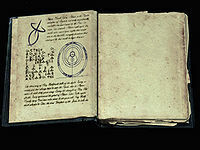 The quest will complete at this point and clear from your journal, although you will have written that you still need to return to Urag after the book has been translated. Wait for at least 24 hours, and when you return Urag will tell you he's finished translating the text. He will give you three identical copies of one of several possible "Shalidor's Insights" scrolls, or will pass on any knowledge gained from the writings in the form of a one-point skill increase to any magic skill other than Enchanting. Which scrolls or skill boost you earn is decided when you hand over Shalidor's Insights to Urag gro-Shub. It is possible to obtain the reward you prefer by saving before giving him the book and reloading the save until the desired reward is obtained. If the quest marker points to Druadach Redoubt, it is possible to complete this quest very easily by doing the Forsworn chain in Markarth, as this is where Madanach has his base of operations. All of the Forsworn in this area are friendly if you completed No One Escapes Cidhna Mine, as long as you sided with the Forsworn in the mine. Rebel's Cairn: partial completion of Find Red Eagle's Sword / Rebel's Cairn. Snow Veil Sanctum: complete Speaking With Silence. The quest marker may also point to the back door, but you still must complete Speaking with Silence. Ysgramor's Tomb: complete Glory of the Dead. If the quest marker points to High Gate Ruins and the player has previously defeated Vokun, the book will be in an inaccessible area in the back of Vokun's Throne Room. Vokun's Throne Room may be accessed by utilizing a follower to open the gate blocking the player from the antechamber exit above the first room. This is accomplished by bringing a follower after clearing out the entire dungeon (clearing out the dungeon may be necessary), climbing up the pile the rubble, in the first room, besides Anska, and using Whirlwind Sprint to access the walkway leading to the exit from the antechamber. The follower will run through the dungeon and eventually appear on the other side of the gate from the player. The follower can then be instructed to pull the chain, thereby opening the gate and permitting the player into Vokun's Throne Room. Unconfirmed on PC. This can be made reachable using console commands, either to resurrect Vokun and kill him again (select the body, not his ashes) or to simply pass through one of the closed gates (use 'tcl' to turn clipping on and off). If the quest Hitting the Books is active when this quest is accepted, sending the player to Fellglow Keep, the "insights" may be missing. To fix this you can type in console sqv mgr21, look for a line REF 'Book'->"(x), x is id you need, then jump and open console again midair so the book wont fall under ground, type in console prid x where x is id you got previously, and last type moveto player. Look for a book on ground. 10 Urag gro-Shub is looking for writings by the Arch-Mage Shalidor, so that he can translate them into something useful for the College. He's asked that I attempt to find another copy for him. 20 I've managed to find the writings of the Arch-Mage Shalidor that Urag gro-Shub was looking for. I should take them to him at the Arcanaeum so that he can translate them. 200 Finishes quest Urag gro-Shub asked me to bring him more of the writings of the Arch-Mage Shalidor. I was able to find another copy, and have brought it to him. He will translate it as soon as he's able, and then we'll see what we can learn from it. On the PC, it is possible to use the console to advance through the quest by entering setstage MGR21 stage, where stage is the number of the stage you wish to complete. It is not possible to un-complete (i.e. go back) quest stages, but it is possible to clear all stages of the quest using resetquest MGR21. This page was last modified on 6 October 2017, at 15:43.